There may be many ways to navigate around Fred Hughes’ music. His pianism is devoid of pretentious posturising and florid, tired figurations. Just fierce swing imbued into a left hand that thrives on peerless timekeeping and bass line inventions while the pianist’s right hand is constantly driving the melody forward, referencing – every now and then – the masters of the instrument from Art Tatum and Fats Waller to Bill Evans and Chick Corea. And, surprise of surprises, Mr. Hughes turns his unique and eloquent voice to stirring up some strife within the confines of Johann Sebastian Bach’s tricky counterpoint in “Two Part Invention No. 4,” and the moody romance of Piotr Ilyich Tchaikovsky’s “Andante Cantabile.” But more than anything else Hughes’ imprimatur as a Bill Evans acolyte is heard with focused engagement, the whispered intimacy with which his every solo flight begins, develops and ends and above all in his powerful-sweet sound. But to exist successful newness of repertoire in the tried and tested trio format Fred Hughes must – and does – display a deftly-constructed exploration of exploration of the relationship between piano, bass and drums. All of the music here on Matrix – exemplary on “B Minor Waltz,” “Dolphin Dance” and on “Samba Song” – is underpinned by the poetic settings of melody, framed by rapid (or almost indulgent cantabile soulfulness in the case of the Tchaikovsky) arpeggios, trills, tremolos and harmonics on the part of Mr Hughes. Most of all, the trio portions of the pieces are all framed by fiercely beautiful and spiky improvised solos on the part of every musician. The lyricism innate in the music is never taken for granted and each piece is imbued with a poetry of its own. 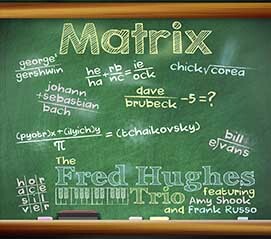 The re-imagining of Chick Corea’s “Matrix” is an invigorating example of the harmonic progress of the maddeningly complex tune is driven right out of the park. Even then, the harmonic progress is stately, with much of the activity revolving around the slowly mutating, repeated motifs interspersed with drum-rolls and bell-like scales that contribute to the attenuated sonorities in this iconic piece. An altogether unforgettable album any which way one wants to look at it.